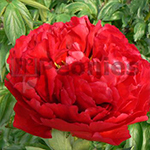 This blood red, semi double Peony is blooming in the early season. The flowers are large and well formed and has many petals wich have a heavy texture and the color is excellent. The stems are strong, straight and heavy. Illini Belle is perfect for cut flower raise as well for landscaping in gardens and city parks. To buy Illini Belle, only for wholesale please contact one of us.